My four day trek started with me losing my head lamp at the first check point. Good thing that my friend Michelle had one ! What a great group of people to spend four days with. This was the best experience and the most challenging experience of my life. I came with my best friend and a great group of people but the guides, Carlos and Hilton, made this trek the best it could possibly be. They kept us motivated and happy the whole four days. It was an adventure of early wake-ups including rooster cross on the second morning. 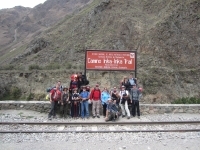 The scenery was beautiful and our porters carried coraza weight across the mountains to have camp set up before we arrived. 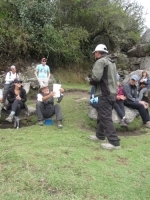 Carlos and Hilton would give us good estimate of time left and fun but informative information on the hike and Inca culture. I got engaged to the King of the Mountain ! So before I came I was apprehensive about camping and trekking again, its been a while, we have a young family. Where can I start to explain the experience I have had ?. From the briefing to the last day I have found it all five star standard. 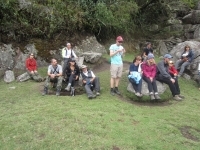 Let me tell you about me and my family, we had an amazing time on the Inca Trail. This trip had been planned for over nine months. We did a lot of research and thought we were prepared for the upcoming hike. To our amazement this was a lot more than we expected. The first day was a great hiking day (let me say the weather was fantastic) it was what I expected, enjoyed the landscape. This was an amazing awe inspiring adventure. I found the whole trip to be well organized and well planned. 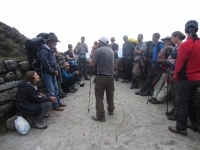 The guides were friendly and informative and inspired all the hikers to become part of one team. 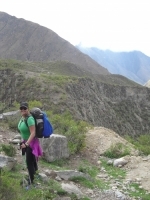 The strength and fitness of the porters impressed me but the size of their packs also left me with some sympathy. 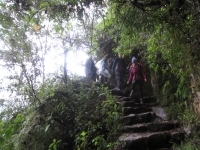 After so much hype I was concerned that the Inca Trail would not live up to expectations. This is the most beautiful hiking I have ever done ! 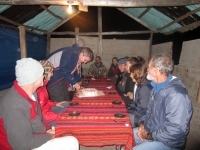 Inca Trail Reservations were great, the food on the trail was amazing. Hike was perfect, as hard as I anticipated. I definitely had to mentally prepare, the second and third day were very difficult. 3000 steps is hard on the body, but the good thing is you never feel rushed. October 2014. 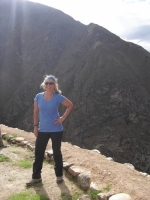 Hiking the 4 day Inca Trail... a dream come true. I knew it was going to be tough but didn't realize I would struggle to get enough air as we ascended so many stairs and ache as we descended many more but the exhilaration I felt as I reached the destination each day was worth the discomfort ! Awesome. The organisation did everything they needed to do. 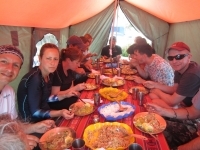 The booking went very smooth (all info via email fast answer back), info meetings before the trail, the whole Inca Trail (4 days) awesome support and information about ruins and nature. The guide Victor spoke very good English and funny as well.